A projection by Teresa Man at the Amsterdam Light Festival. You’ve heard all the buzzwords for 2018: collaboration, user experience (UX), innovation, partnership. Integrated Systems Europe (ISE) 2018 is all of those things—and all in one place. The show, held February 6-9 at the RAI in Amsterdam, has broken its own attendance records year after year, and plans on doing so again in 2018. So how is it drawing in the AV industry and all its side-hustlers? If you’ve attended ISE in the past, you know the show floor is enormous, and the number of new technologies is borderline overwhelming. To get the most out of the show, a carefully executed strategy is a necessity. So what are some of the key trends to explore? Datapath also expects “collaboration to be big business at ISE,” according to Bjorn Krylander, managing director. The company will host “demonstrations of how any application window can be easily shared, with the option to share to a video wall for meetings and process management,” in its Hall 11 stand, and using its Quant application software. Mike Blackman speaking at the ISE show. On the video side of the house, quality will continue to improve, creating stunning displays and projections that our eyes have only dreamed of. “The biggest trend at ISE will be still be the advancements in solid-state illumination and the rise of higher resolutions,” Mark Wadsworth, international marketing manager, Digital Projection, said. The company will be launching its new 8K INSIGHT Laser Projector, which can be seen at stand 1-F40. ISE also plans on helping integrators and installers understand the “power of trying new things,” according to Blackman. New in 2018, the XR (Extended Reality) Technology Zone, will be located at the rear of Hall 8, in the Park Foyer. Attendees can test out different types of XR, including augmented and/or virtual reality, to gain firsthand experience with the business opportunities they can create. Technology. Innovation. Design. Experience. The aptly named TIDE program is sure to be the belle of the ball at ISE. This thought-provoking, daylong session explores the creative forces from design, architecture, technology, live events, and art, and discusses the results and experiences design-thinking creates for business, according to AVIXA. Daan Roosegaarde, internationally acclaimed creative thinker and founder of Studio Roosegaarde, which develops projects that explore the relationship between people, technology, and space, will keynote the TIDE conference. Following the keynote will be a series of fast-paced talks, panels discussions, breakout sessions, workshops and networking opportunities. TIDE will be held Feb 5 at Hotel Okura Amsterdam, the day before the ISE show floor opens. The event will close out with artist and designer, Monika Bielskyte. Bielskyte creates future-world prototypes and spends a large portion of her time focusing on research and strategy in the immersive technology space. With clients like Universal, Dreamworks, Aston Martin, and the United Arab Emirates government, there is no doubt attendees will leave TIDE dreaming of their own future and how they can incorporate next-generation tech into AV projects. Innovation and partnership are the pillars of ISE. 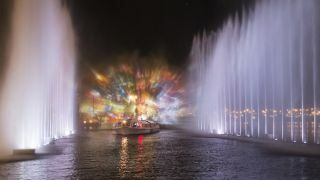 Thus, it makes sense that the show is working with the RAI (its host venue), the Amsterdam Light Festival, and Artifex, a local cultural organization, to host the inaugural World Masters of Projection Mapping. The event will showcase the art of projection mapping and explore collaboration between artistic creativity and cutting-edge technology. Amsterdam Light Festival, now in its sixth year, is managing the competition, which will showcase work from five competing artists on the façade of the EYE Filmmuseum; the winner will be announced at the RAI on February 9, the final day of the ISE exhibition.